Azotic has conducted hundreds of field trials around the world. 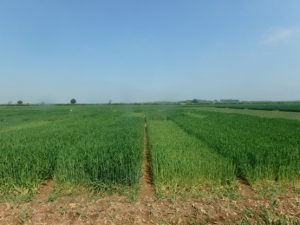 These trials have helped us “fine tune” our formulation for a nitrogen fixing solution, and have shown that Envita can work across many different crops in different growing regions. Many other crops have been evaluated with Envita™, and have been successfully colonized by Gd. Independent field trials have shown significant yield increases due to Envita. If a grower wants a yield boost, they can apply Envita in combination with their regular nitrogen fertility program. If a farmer wants to maintain their normal crop yield and reduce their nitrogen fertilizer that is an option too. Farmers can select whatever option is best for their field: yield boost or same yield with less nitrogen. Interested in trying Envita for your own crops? Register to get started and see the world of difference it can make.